Cloud contact center vendor Five9 has been on a roll of late. Earlier this month, it made big news when Cisco veteran Rowan Trollope joined the company as its new CEO. This week, it announced its Spring Release 2018, which includes a number of artificial intelligence (AI) features that can be used today to improve customer service. Five9 has maintained a cadence of annual major releases that have kept the relatively small vendor out in front of its larger competitors. Its Summer Release 2017 centered on global expansion and migration to a new, modernized platform. This had less user sizzle than 2018's AI-focused release, but it was important as it enabled the company to move faster and be more agile. In fact, Five9 likely could not have done this week's AI launch without the new platform it rolled out in 2017. No Jitter editor Michelle Burbick already covered most of the new features of the Spring Release in her post, so I won't rehash those details now. However, I do want to discuss its new architecture and why it's important for Five9 now and in the future. Most of the UCaaS and CCaaS providers built their platforms well over 10 years ago, with many approaching the two-decade-old mark. During that era, the concept of microservices and loosely coupled services didn't really exists. Instead, cloud providers deployed monolithic, vertically integrated platforms. These met the needs of that time, but can hold cloud providers back as they try and add new features quickly. 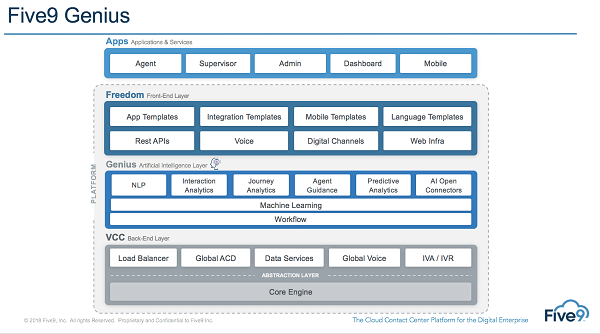 As the below diagram shows, Five9's solution is completely modular, enabling the company to insert a set of AI services between the back-end service and front-end layer. This lets Five9 build one set of AI capabilities and apply them to the layer above and below. If it wants to add a new capability, it simply needs to add it as another set of services, which means that ultimately, Five9 customers can access new features and functionality with minimal downtime and risk. One of the reasons I like what Five9 is doing with its Spring Release around AI is that it's releasing functionality that contact centers can use right now. The Five9 Genius example provided in its press release uses AI to give the contact center agent all the information they require to solve a customer's problem immediately. Providing the agent with the right information not only saves time but also has an empowering effect on the agent so he or she can make decisions without having to escalate the call or place the caller on hold to talk to a higher-level person. If digital businesses are competing on the basis of customer experience, then having a higher percentage of first-call resolutions will go a long way toward creating the "wow" factors customers are looking for today. Five9's Engagement Workflow is interesting as well, as it takes advantage of its own and third-party machine learning capabilities to optimize workflows for customer interactions across all channels. Managing workflows across voice is hard to do manually but certainly achievable. Managing workflows across two to three channels its more difficult but one could probably muddle their way through. However, across this multi-channel world we live in, where customer preference to the channels is constantly changing, optimizing workflows with manual methods is impossible. Machines don't do everything better than people, but they can connect the dots between lots and lots of data faster and more accurately. In this release, Five9 also included a number of new APIs, a customizable supervisor dashboard, and a multi-role performance portal. Think of the dashboards as being a quick way for agents and supervisors to view the output of the analysis that the AI is doing. The dashboards show a wide range of key performance indicators (KPIs) that can be used to further improve customer service. This kind of visibility is important to ensure the goals of the business are always being met. If there's some anomaly, it could indicate bad data that's leading to bad insights, enabling the business to take a closer look at why that is. The approach Five9 is taking is to deliver practical things that businesses can use today. There's not a company out there that can't use better informed agents, optimized workflows, and visibility into KPIs. Juxtapose this with the approach that Google took with Duplex -- trying to use AI to give everyone an assistant to make calls for them. This seems backwards to me; I don't need AI making calls for me, I need one helping the person I'm talking to make better decisions. One of the examples Google gave was when someone called a restaurant and tried to make a reservation and the person on the other end had a heavy accent and couldn't understand. The Google AI actually hung up without making the reservation after the person told them to "just come in." Well, what if the person who wanted the reservation called in and up on the screen popped up information that the caller goes there every week, makes a reservation for four people and prefers to sit by a window? The restaurant representative could greet the caller by name and ask, "Thanks for your business, I can confirm you with your usual time, is this what you would like?" To me, this seems like a better use case of AI than having a virtual assistant make calls for me. For simple tasks, this might be ok, but normally I'm calling because of something a bit more complex. I understand there were oohs and ahhs because it was Google, and those types of AI use cases might come in handy sometime in the future. Most businesses are going to crawl before they walk and run, and the approach Five9 is taking lets businesses get started with AI today.